Performers include: Esther Rolle, John Amos, Jimmie Walker, BernNadette Stanis, Ralph Carter, Ja’net DuBois, Johnny Brown, Janet Jackson, and Ben Powers. 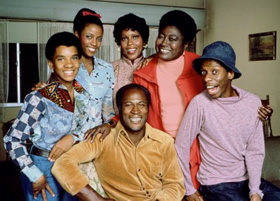 Created by Michael Evans and Eric Monte, and based upon Monte’s childhood, this sitcom follows the life of the Evans family in the projects of Chicago. Spun-off from Maude, sassy housekeeper Florida Evans (Esther Rolle) and husband James Evans, Sr. (John Amos) struggle to make ends meet and raise their three children; gifted artist James Jr. or “J.J.” (Jimmie Walker), intelligent Thelma (Bern Nadette Stanis), and young activist Michael (Ralph Carter). Florida’s best friend, neighbor Willona Woods (Ja’net Du Bois), is also a fixture in their lives. Later in the series, the Evans children have to survive without their parents. James is killed in a car accident and Florida marries Carl Dixon (Moses Gunn) and relocates to Arizona for his health (she eventually returns). Willona steps in to help to take care of her best friend’s kids while looking after her own adopted daughter, Penny Gordon Woods (Janet Jackson). Building superintendent Nathan Bookman (Johnny Brown) also plays a role in the Evans’ lives as does Thelma’s football-playing husband Keith Anderson (Ben Powers). The show doesn’t shy away from issues of race, poverty, unemployment, or crime and each issue is handled seriously but with humor. When times are tough for the Evans, they always pull through.